SEVEN of the memorandum of agreements (MOA) for the mining projects in the country have been completed and will be submitted to the National Executive Council (NEC) for approval in January, 2017. This is from the Mineral Resources Authority (MRA) while giving an update on the status of these agreements. Each of the operating mining projects have in place an MOA that sets out the benefits sharing arrangements between the National Government, the host provincial and local level governments and the immediate mine area landowners. The MOAs are reviewed periodically as agreed by the stakeholders. Those completed are for the Ramu mine in Madang Province, Simberi (New Ireland), Hidden Valley (Morobe), Ok Tedi (Western Province), Tolokuma (Central) and Sinivit (East New Britain). MRA’s managing director Philip Samar told the Post-Courier that once they have been approved by the NEC, the actual signing ceremony will be held at each of these project sites. “This is to allow the project stakeholders to witness such an occasion,” Mr Samar said. Also completed is Woodlark in Milne Bay, which is one of the two new approved mining projects. He said the review process for Porgera, Lihir and Crater Mountain are yet to be completed. The current exercise will continue in 2017 along with the country’s first ever deep sea mine – Solwara-1. Mr Samar said this will be the first time that any government has submitted more than one revised MOA in the last 10 years. He said one of the improvements that the MRA is embarking on to improve is administration and transparency of the revised MOAs by making allowances for autonomous parties to administer each of them, and to facilitate annual meetings where the independent auditor presents the implementation scorecards for each of them. “This way all parties will be held to fully account for the implementation of their commitments on an annual basis,” he said. PREVAILING low world prices on nickel, cost reduction and production issues were matters that the developers of the Ramu mine in Madang had to contend with in 2017. The environment would have been made even tougher, had it not been for the support of the landowners of the four impact areas of the country’s lone nickel and cobalt mine. 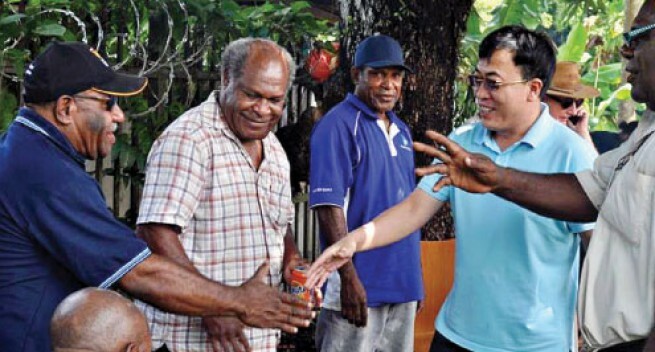 This was acknowledged and the landowners thanked, at a Christmas party its Community Affairs Department hosted for them in Madang last Wednesday. In attendance was the miner’s vice president Wang Baowen. “Despite these financial deficits, we have overcome most of the technical problems with improved management system, and today our product output has improved with low operational costs. “We hope that the nickel price improves soon, so we can earn some profits and deliver to our project partners. “Social security, including landowners’ expectations on employment and business opportunities are major challenges as well. This happens everywhere and our project is no exception. We fully understand the expectation of our landowners,” Mr Baowen said. Peter Tai, chairman of Maigari who spoke on behalf of his three colleagues Tobby Bare (Kurumbukari Mine), Sama Melambo(Basamuk Refinery) and Jeffrey Kinang (Coastal Pipeline), thanked the company for its support and continued operation in-spite of the economic challenges. Mr Tai, while vowing their continued support, had also cited some outstanding issues and urged both the government and the developer to ensure a resolve. Chairman of RamuNiCo umbrella company, Raibus Limited, Steven Saud representing all project landowner companies acknowledged that 2016 has been a tough year for RamuNiCo and landowner businesses due to the global economic situation affecting all PNG companies. He thanked the company for not quitting. General manager of Community Affairs, Martin Paining said RamuNiCo project is unique in PNG and urged the landowners to support it until the economic climate is healthy so all parties can benefit. “So we have a situation and environment to understand each other well and work for common benefit,” Mr Paining said. PanAust [owned by the Chinese company, Guandong Rising Assets Management] is keen to start development of the Frieda River copper-gold project, Managing Director Fred Hess told the Papua New Guinea Mining and Petroleum Investment Conference in Sydney last week. But he warned there are many obstacles to overcome before a final decision to go ahead with the mine. Hess said the nature of the resource at Frieda River in West Sepik Province is well understood, noting that the project ‘has been known about’ for almost 50 years. ‘We are now in the phase where we are waiting for permit approval to take place,’ he told the conference. ‘Realistically, with the elections due next year, and with the size and complexity of the project, we are expecting that may take a while to get through to completion. Hess described the project as a substantial open cut mining operation dominated by a very large storage facility. ‘That facility is designed to take the tailings from the processing plant and the waste from the mine and all of that sits behind a very large embankment,’ he said. Hess said the embankment will take up about 40 per cent of the total capital cost of the project. ‘It doesn’t produce any copper but it is a necessary requirement in order to produce copper,’ he told delegates. 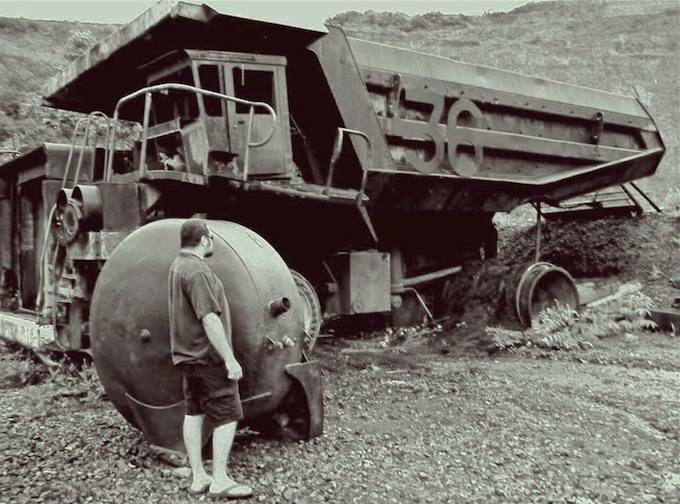 ‘It is distinctive in the sense that PNG has traditionally taken cheaper forms of tailings and waste disposal routes. ‘But, because of the issues that we have with Frieda River being upstream from the Sepik River, this is the solution we have come up with which we think addresses all the environmental issues that are so important to a project like this succeeding. ‘The other special part of this project is that, because of the size of the embankment, because of the size of the catchment it sits in and the amount of water that falls as rain and gets collected in the catchment, and because of the height of the embankment, the opportunity to produce hydro-electric power also presents itself. Hess said the project is of national significance, describing it as a ‘world scale deposit’ that is in the top 10 undeveloped copper deposits in the world. He said it will create many jobs for locals, but he warned that there are challenges. ‘There are no free lunches. We must be mindful of the risks of developing large scale projects. Frieda River has substantial logistical challenges. It is inland; there are no roads. ‘For access to the site for the main logistics required you go up the Sepik River for 600 kilometres and then you need a road for another 100 kilometres, up to the actual mine site. Hess said there are no port facilities capable of supporting the mine and no electricity grid. ‘There are no roads. We are significantly infrastructure-challenged in this location. That challenge represents an additional capital burden to the project. ‘Over the last four or five years there has been a significant decline in the price of copper and that represents a significant challenge to making an investment decision. Notwithstanding the recent jump, it still represents a long term challenge. What will the copper price be in order to support an investment decision? ‘The other major risk we face is the policy environment in which we invest. This project, to generate a return, will probably take at least two political cycles in PNG and to actually realise the benefits of those returns, many more political cycles. Hess added that the potential rewards are substantial, balancing the risk. He said the existing resource base of 2.5 billion tonnes of ore is ‘not closed off’ and that there are further opportunities. PanAust [owned by GRAM] controls 80% of the Freida River project, with Highlands Pacific the remaining 20%. As with all mining projects in PNG, the State has the option to buy in to up to 30% of the project prior to the granting 0f a special mining lease. PanAust applied for a Special Mining Lease in June 2016. With the Chinese expanding their mining interests in Papua New Guinea, is the pollution and desecration being suffered in Tibet a foretaste of the anguish to come in PNG? High in western China’s Sichuan province, in the shadow of holy mountains, the Liqi River flows through a lush, grassy valley dotted with grazing yaks, small Tibetan villages and a Buddhist temple. But there’s ­poison here. A large lithium mine not only desecrates the sacred grasslands, villagers say, but spawns deadly pollution. The river used to be full of fish. Today, there are hardly any. Hundreds of yaks, the villagers say, have died in the past few years after drinking river water. 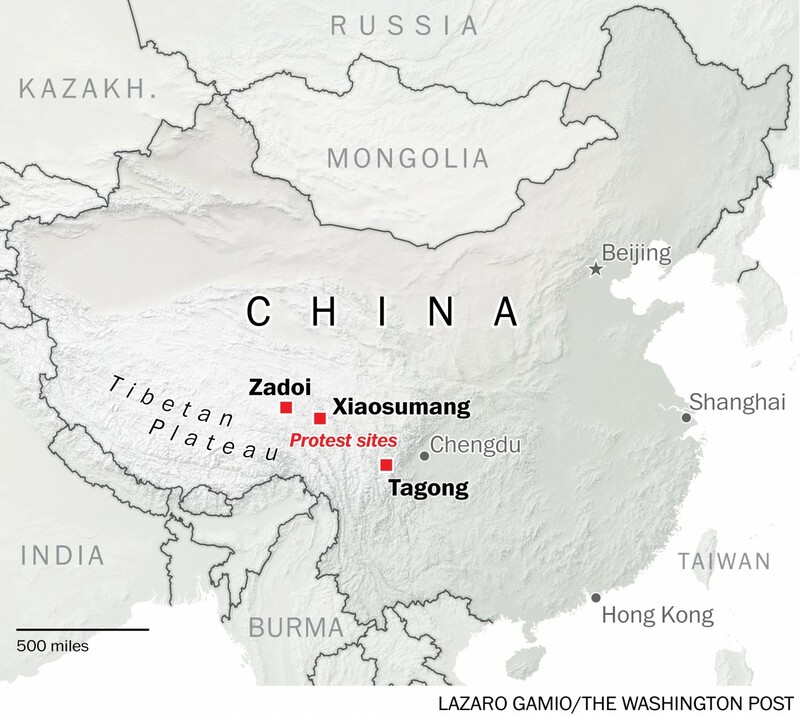 China’s thirst for mineral ­resources — and its desire to exploit the rich deposits under the Tibetan plateau — have spread ­environmental pollution and ­anguish for many of the herders whose ancestors lived here for thousands of years. The land they worship is under assault, and their way of life is threatened without their consent, the herders say. A local environmentalist, who also declined to be named to avoid backlash from the authorities, said he had done an oral survey of local opinion and found that Tibetans would oppose mining projects even if companies promised to share profits with local communities, to fill in mines after they were exhausted, and to return sites to their natural state. 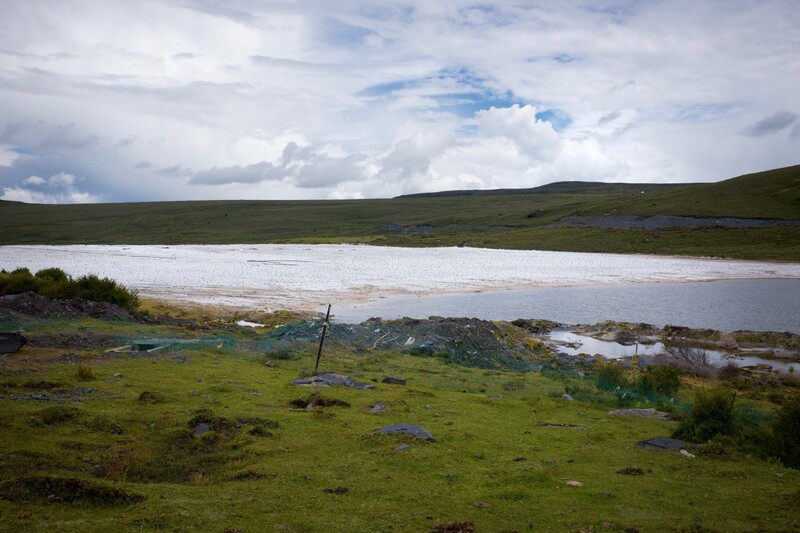 It was in 2009 that toxic chemicals from the Ganzizhou Rongda Lithium mine first leaked into the river, locals say, killing their livestock and poisoning the fish. “The whole river stank, and it was full of dead yaks and dead fish,” said one man downstream in the village of Balang, who declined to be named for fear of retribution. Another pollution outbreak and a protest by villagers in 2013 forced the government to order production temporarily stopped, locals said. But in April, just after mining restarted, fish began dying again, ­locals said. “That’s when we just knew they had lied,” the man said. In May, residents staged a second protest, scattering dead fish on a road in the nearby town of Tagong. The protesters were surrounded by dozens of baton-wielding riot police. Again the government stepped in, issuing a statement to “solemnly” promise that the plant would not reopen until the “environmental issues” were solved. But the problem at the Jiajika mine is not an isolated one. Across Tibetan parts of China, protests regularly erupt against mineral extraction, according to a 2015 report by Tibet Watch. 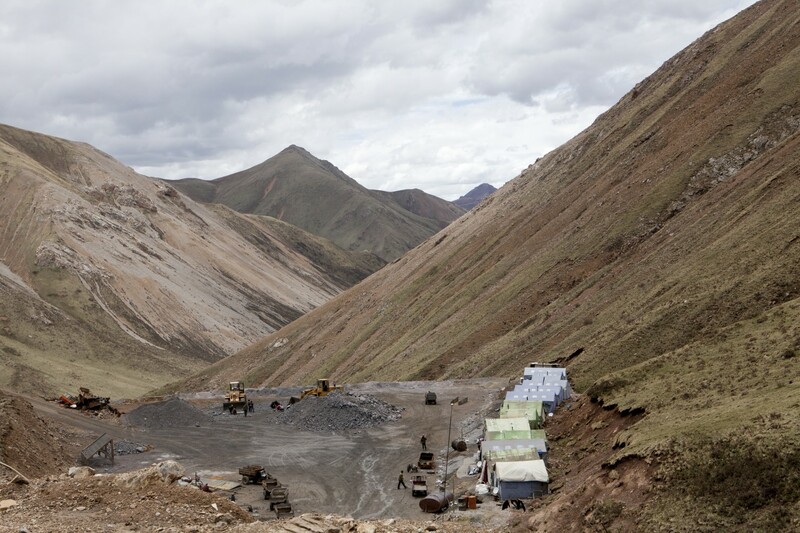 China is focused on copper and gold extraction from Tibet but is also exploiting a whole range of minerals “with increasing intensity,” including chromium, iron, lithium, iron, mercury, uranium and zinc — as well as fossil fuels such as coal, oil and natural gas, the report said. Although China boasts of its ­development work in western ­regions where Tibetans live — hauling millions out of poverty and nearly doubling life expectancy over the past five decades — the report argued that much of the transport and other infrastructure in the region is aimed at extracting minerals rather than benefiting residents. Projects usually import workers from other parts of China, seldom employing Tibetans in significant numbers. When protests break out, ­China’s response “has generally been heavy-handed,” with authorities seeking to politicize the protests, Tibet Watch wrote. Understanding those risks, ­Tibetan communities sometimes use creative ways to get their message across. When hundreds of people gathered in August 2013 in Zadoi county in Qinghai province to protest against mining on what they considered to be a holy mountain, they flew Chinese flags to demonstrate their loyalty to the state and erected posters and placards quoting President Xi Jinping’s words on the need to balance economic growth and environmental protection. It didn’t help. Police and paramilitary forces arrived in large numbers and fired bullets above the crowd, according to campaigners at Free Tibet. The group said eight people were arrested and many more injured. 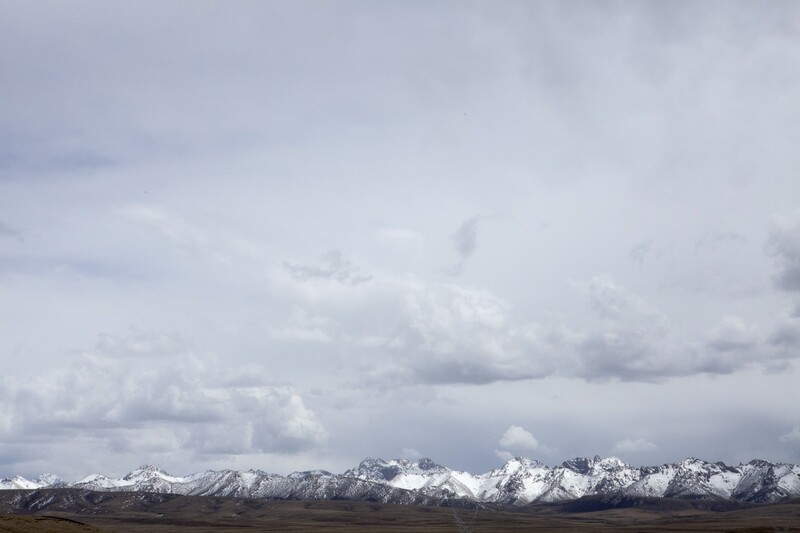 In the villages outside Xiaosumang township in Qinghai, residents blame a lead and zinc mine for the deterioration of the grasslands for miles around, and even for falling harvests of caterpillar fungus, a highly prized health cure that is the backbone of the local economy. Contaminated water from the mine, residents said in a joint letter to the authorities in 2010, not only killed their livestock but also caused people who drank it to die of cancer, they said. “Over the years, many herders would sigh and say: ‘Life can’t go on like this anymore. Even drinking has become a big issue for people living on the grasslands,’ ” the letter said. A May 2009 protest in the village of Xizha prompted a severe crackdown, the letter said, with guns and tear gas used, seven women severely beaten, and 12 men blindfolded, detained and tortured. Whether the mine is truly the culprit for all the grasslands’ ills is another matter — climate change, for example, is probably an important factor. But that doesn’t soothe local anger. In Jiajika, 300 miles to the southeast, the commercial pressure to reopen the lithium mine is mounting. The element is a vital component in rechargeable batteries used in cars, smartphones, laptops and other electronic and electrical items. Demand — and prices — are skyrocketing. 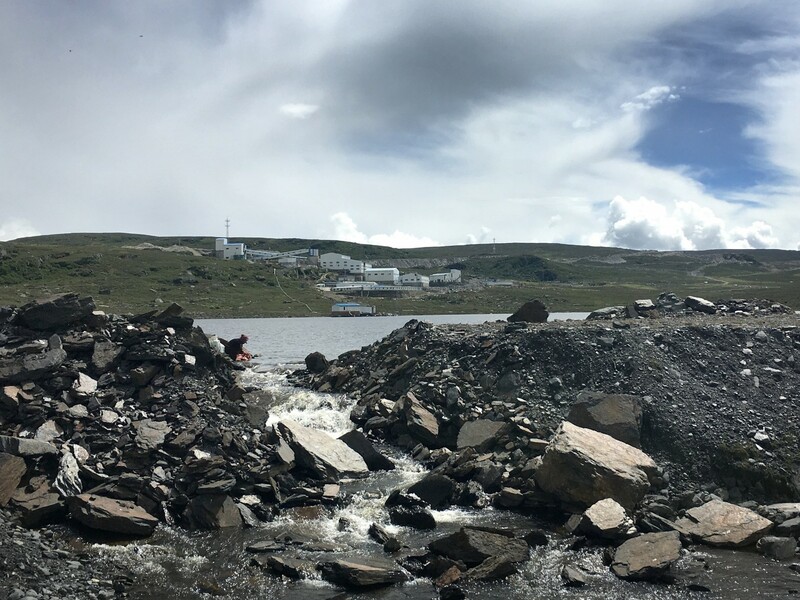 Last January, Youngy Co. Ltd., the parent company of Ganzizhou Rongda Lithium, promised investors that the local government would step up efforts to reopen the mine in March. That same month, an article in the local Ganzi Daily newspaper outlined the authorities’ dream of making the area “China’s lithium capital,” calling Jiajika the biggest lithium mine in the world with proven reserves of 1.89 million metric tons and even greater ­potential. Three companies, including Rongda, will invest 3.4 billion yuan ($510 million) in the site by 2020, the article said. He Chengkun, Youngy’s media officer, said an official investigation had established that the plant was not responsible for killing fish in 2013 or this year. He said the plant has been closed since late 2013 because of problems relating to land acquisition and denied that it had restarted operations in April, as locals claimed. Nevertheless, across the Tibetan plateau, resource extraction, land grabs and environmental destruction remain flash points for conflict between Tibetans and the authorities, said Free Tibet Director Eleanor Byrne-Rosengren, reflecting both local grievances and the wider problem that Tibetans do not have the right to decide what happens to Tibet and its resources. Xu Yanjingjing contributed to this report. Papua New Guinea’s oil and gas boom – blessing or curse? Resource extraction projects in Papua New Guinea have a decidedly mixed history. Will things be different this time around? A deadly conflict is currently raging in Hela Province, home to the country’s largest gas project – the conflict does not directly relate to the gas plant there, but some fear the facility could be targeted. After a bidding war between multinationals, plans are moving forward to begin exploration of additional offshore gas fields. Despite its wealth of natural resources, Papua New Guinea remains one of the poorest countries in the world. Analysts say it is a classic example of the “resource curse” – a country where rich resources are associated with low levels of democracy and overall economic development. Papua New Guinea announced last week that it is deploying its military to quell violence in Hela Province, home to the country’s largest oil and gas project. Tribal conflict in the area has turned deadly this month, raising concerns about human rights and public safety as well as the potential impact on the operations of the PNG LNG (liquefied natural gas) project, operated by ExxonMobil. The company is not directly implicated in the conflict. 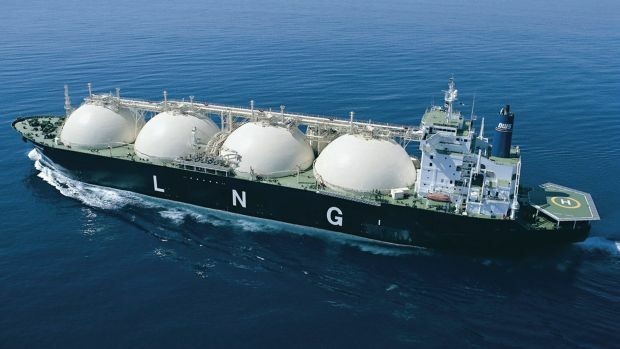 However, Prime Minister Peter O’Neill told Australia’s ABC news service the government would ask ExxonMobil and Australia’s Oil Search, a partner in the PNG LNG project, to provide logistical support to boost the security operation. The plant has also been a recent target of anger in the highlands. In August, local landowners blockaded roads leading to a natural gas facility in Central Province, demanding delayed royalty payments. This month, with tension mounting in the area, landowners reportedly threatened violence against the plant if a promised equity deal falls through. Papua New Guinea is a country in transition. Perhaps best known for lost tribes and uncharted land, today PNG is hurtling into the 21st century – a shift that is clearly causing more than a few growing pains. While its past remains an integral part of its present, many of the country’s leaders are hopeful its abundant natural resources will provide the funds necessary for PNG to become a modern and prosperous state. The conflict currently raging in the highlands demonstrates the pitfalls of this process. Customary landowner Auwagi Sekapiya of the Ubei Clan, Kosuo tribe. 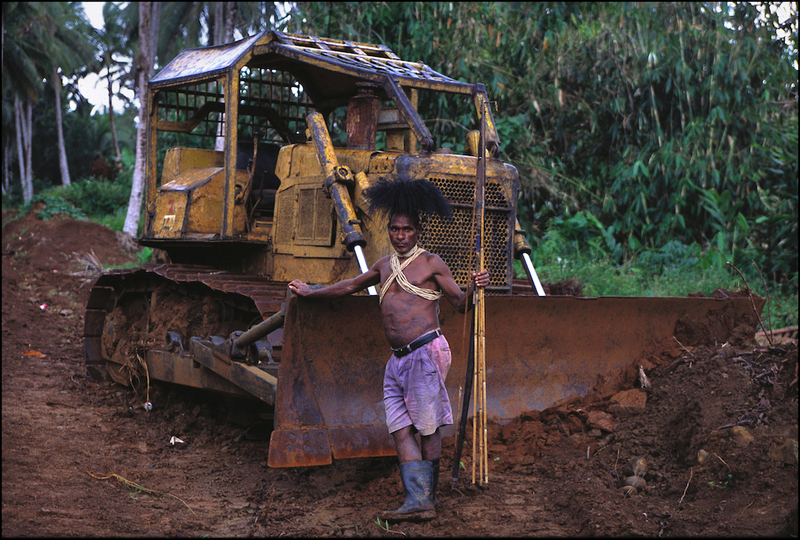 Photographed here in 2003 in front of a bulldozer, he was angry that a logging road destroyed his sago swamp. Photo courtesy of Sandy Scheltema/Greenpeace. For decades, the mining of gold, copper and other minerals has been the mainstay of PNG’s extractive economy. More recently, oil and gas have become some of country’s most important exports. In September, both the American oil giant Exxon Mobil and Oil Search bought 40 percent shares in two separate offshore explorations permits in the Gulf of Papua. 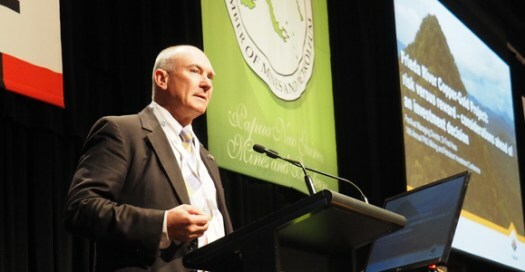 Peter Botten, managing director of Oil Search, said the maritime area, almost 150 kilometers (93 miles) off the capital Port Moresby, has “significant gas potential.” The purchase followed a bidding war between Exxon Mobil and Oil Search for shares in InterOil, a Singapore-Papua New Guinea company that offers investors a way into the Elk-Antelope gas field, believed to be one of the largest untapped gas deposits in Asia. The bidding war, which included France’s Total part-funding Oil Search’s bid, was credited by analysts as a sign of companies’ faith in improving international oil and gas prices and Papua New Guinea’s importance for the industry. River in the rainforest near Mt. Bosavi. 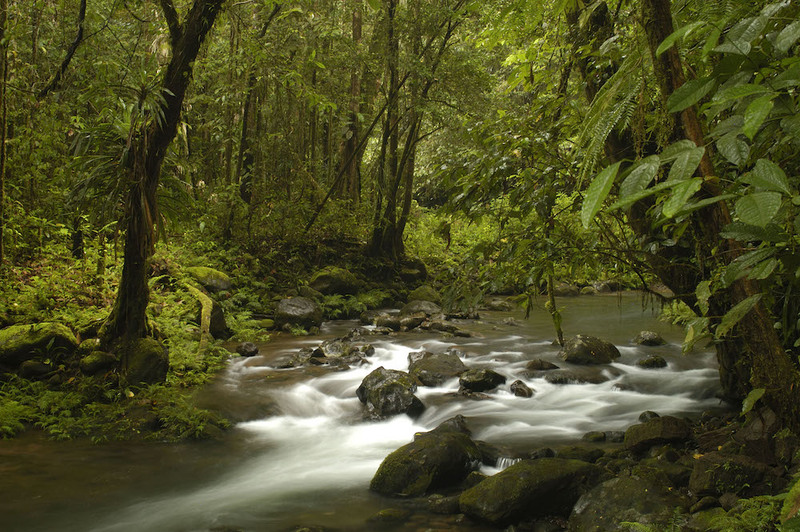 New Guinea’s rainforests are the third-largest in the world. Photo courtesy of Markus Mauthe/Greenpeace. Even if nothing goes wrong, developing PNG’s petroleum industry will inevitably have a huge environmental impact. “Exploration and extraction of oil and gas will bring mass amounts of infrastructure, like pipelines and shipping, potentially resulting in land clearing,” Lowrey says. Take, for example, ExxonMobil’s PNG LNG Project, which began production in 2014. The project sources gas from seven fields across the country, most onshore. Gas is transferred by a 407-kilometer-long (253 miles) subsea pipeline and a 292 kilometer (181 mile) onshore pipeline to two production facilities, where the gas is liquefied before being loaded onto ocean-going tankers that are then shipped across the region. As part of this project, the following had to be built: nine new wells in one onshore field; a new airstrip for the delivery of heavy duty machinery; more than 700 kilometers (435 miles) of pipeline; and the expansion of the docks for transport. And this was only a fraction of the infrastructure needed for the project. Women crossing a river on the way to Mt. Bosavi in Southern Highlands Province. Photo courtesy of Markus Mauthe/Greenpeace. In a 2007, essay titled Fasu Solidarity: A Case Study of Kin Networks, Land Tenure, and Oil Extraction in Kutubu, Papua New Guinea Gilberthorpe explored the impacts of the country’s first commercial oil field development, located in the southern highlands. The use of cash royalties and “the imposition of centralized judicial constructs of corporate landholding groups” radically altered the traditional, social interactions between kin groups and communities. “Males are becoming isolated from pre-oil exchange networks, and females are becoming isolated within villages,” she wrote. More recently, the protests in Central Province show the potential for social unrest when expectations about cash royalties go unmet. The extraction the country’s abundant resources, especially oil and gas, was supposed to transform the country and its economy. But it hasn’t, writes Charles Yala, Director of the National Research Institute, a local think tank: “The petro-oil-gas dollars [are] disappearing into thin air, leaving behind an impoverished nation,” he wrote in Business Advantage PNG. Despite the wealth the industry has created, Yala says the economic situation remains dire: getting to and from the country remains difficult and costly; accommodation can be more expensive than in most Southeast Asian capitals; internet access is poor; electricity supply is scant; and the government does not do enough to allow smaller businesses to prosper. 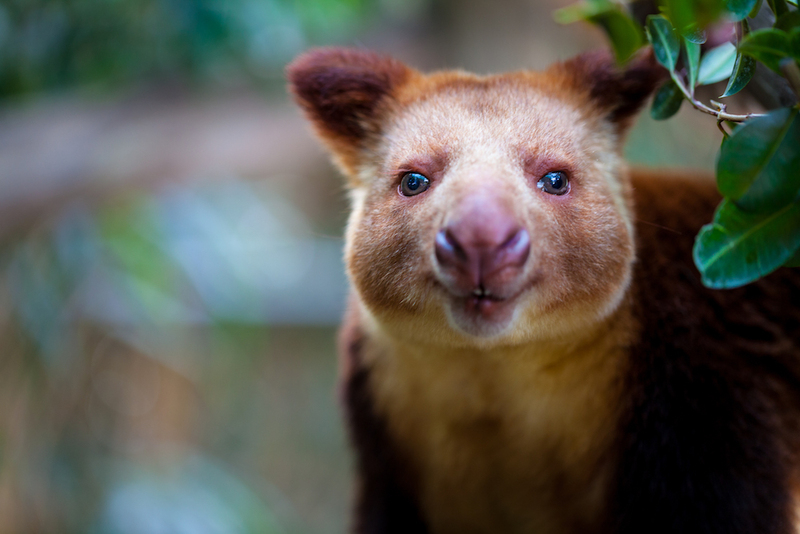 A tree kangaroo, one of the many incredibly rare species living in PNG’s lowland forests. Pictured here at the Melbourne zoo. Photo courtesy of Tom Jefferson/Greenpeace. 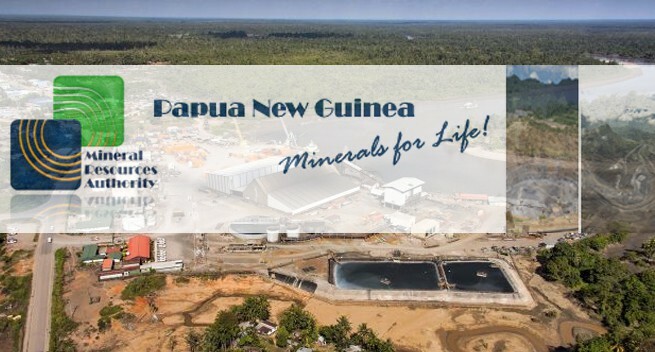 In October, an analysis by Development Policy Center, a think tank ran out of the Australian National University, estimated that while PNG’s mineral exports in the first quarter of 2015 were worth $1.6 billion, government revenue for this sector amounted to just $8 million, or roughly 0.5 percent of the total value. Some of this, the article noted, was likely due to a lag in between exports being made and taxes on them being paid, as well as changes in how the state receives its share of the sector’s profits. Nevertheless, it concluded that “what the numbers illustrate most clearly are the effects of price volatility in the sector, and the subsequent, highly uneven returns to the government.” This volatility make it “extremely difficult for governments to manage these flows effectively, and makes strategic development planning difficult,” the report noted. “In this regard, and others, Papua New Guinea certainly exhibits many of the classic markers of the ‘curse’,” the paper noted – referring to the theory that countries possessing an abundance of natural resources tend to have less democracy, less economic growth and worse overall development than countries without such resources. While not universal, the paradox of the “resource curse” has been found in countries across the world, particularly those without a history of good governance. Papua New Guinea’s fund will be split into three sections, according to an interview with the High Commissioner of Papua New Guinea to Australia, Charles Lepani. The Future Generation Fund is intended to put aside money for the decades to come; the Infrastructure Fund to revitalize what is needed today; and the Budget Stabilization Fund to support the country’s growing budget. 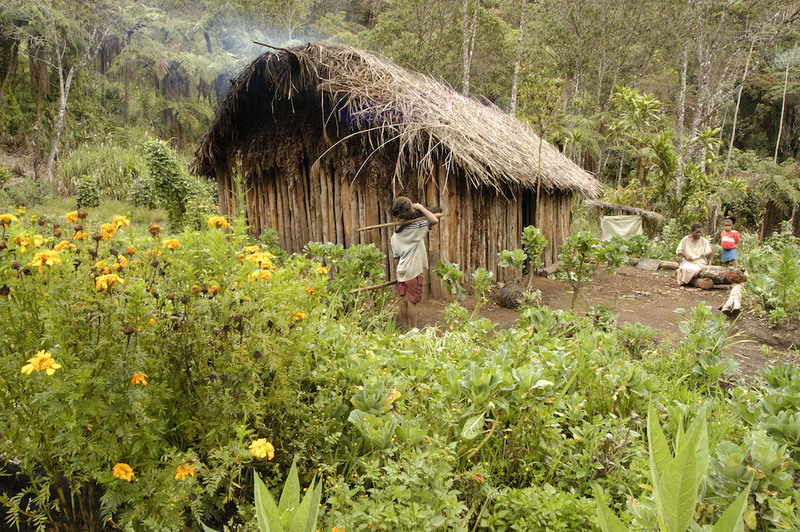 A mountain hut in the highlands of Papua New Guinea. Photo courtesy of Markus Mauthe/Greenpeace. Again, there is a concern that its sovereign wealth fund might itself become another curse. In Timor-Leste, analysts have spoken of the government’s overuse of the fund to boost the state budget, which could lead to it being empty within a decade. Experts have warned that politicians in Papua New Guinea must provide accountability and expertise when managing the fund, so money for future generations is not wasted. The biggest task for future governments will be tackle corruption in the face of a slosh of new petrodollars. Transparency International’s latest index on corruption perception, in 2015, put Papua New Guinea 139th out of 168 countries. Without effectively tackling this endemic practice, the money available for necessary social projects and infrastructure development could slip away from the state’s coffers. Shedding PNG blood for corporate interest – didn’t we learn? 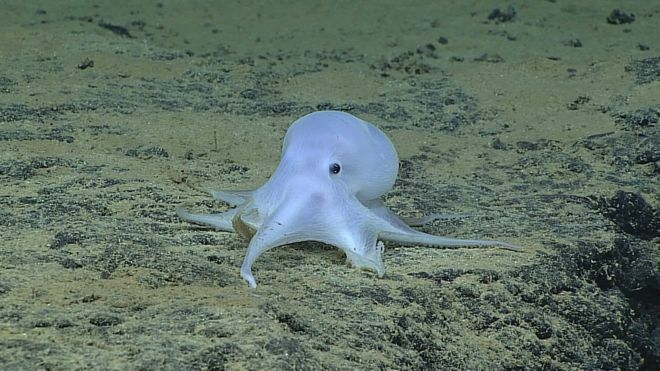 A deep sea octopod, dubbed “Casper” after the film ghost because of its appearance, could be at risk from mining, scientists say. The animal, possibly a new species, was discovered last spring at depths of more than 4,000 metres (2.5 miles). Studies suggest females nurture their eggs for several years on parts of the seabed that contain valuable metals. Commercial companies are interested in harvesting metals and minerals from the bottom of the ocean. There are growing concerns about the future impact of mining on life in the deep sea, much of which has yet to be discovered and categorised. The octopus lays its eggs on the dead stalks of sponges, attached to rocky crusts which are rich in metals like manganese. The female then protects the eggs as they grow, perhaps for a number of years. “The brooding observation is important as these sponges only grow in some areas on small, hard nodules or rocky crusts of interest to mining companies because of the metal they contain,” said Autun Purser, of the Alfred Wegener Institute’s Helmholtz Centre for Polar and Marine Research in Germany. The “Casper” octopod was spotted last year by the camera of a submersible vessel remotely operated by NOAA off Necker Island near Hawaii. A type of octopus without fins, it crawls along the seafloor. Jon Copley of the University of Southampton, who is not connected with the new research, said the record for octopus mothers keeping vigil over their eggs is four years, by another deep-sea species in the Pacific. If this species is similar, then it could be particularly vulnerable to disturbance by deep-sea mining, he said. “This discovery shows how we need far greater understanding of fundamental ecology – and far greater knowledge of the natural history of individual species – in deep-sea environments being targeted for future mining, before its potential impacts can really be assessed,” Dr Copley told BBC News. The German and US researchers investigated deep sea environments using remotely operated vehicles, and towed camera surveys, between 2011 and 2016. They observed 29 octopods from two distinct species on the bottom of the Pacific Ocean off the Hawaiian Archipelago and in part of the Peru Basin. Two octopods were seen to be brooding clutches of eggs that were laid on stalks of dead sponges, which require manganese to grow and stay attached to these rocky crusts or nodules. “These nodules look a bit like a potato, and are made up of rings of different shells of metal-rich layers,” said Dr Purser. The scientists say the future of octopods and other animals, large and small, must be considered when managing “commercially attractive, yet bio-diverse and poorly understood deep sea ecosystems”.